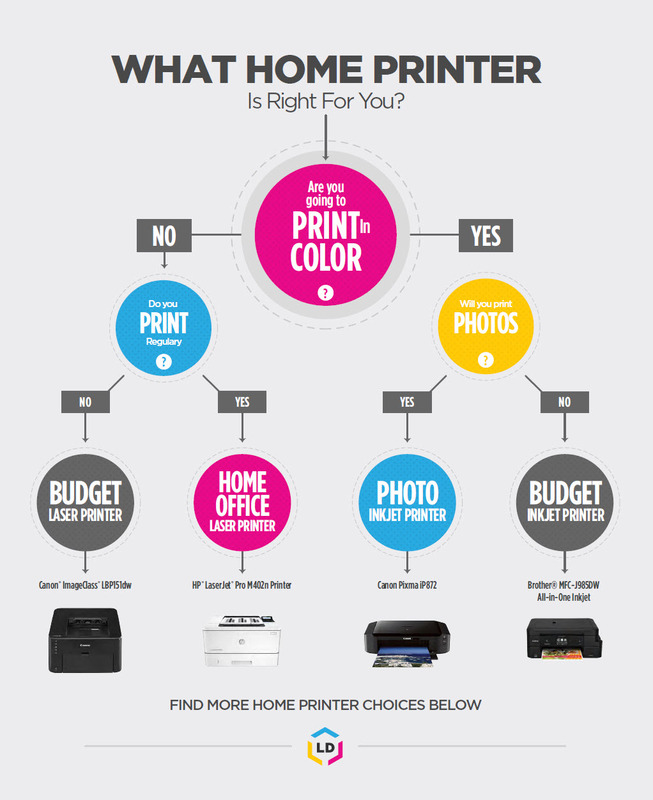 Printer Buying Guide: What Printer Should I Buy? 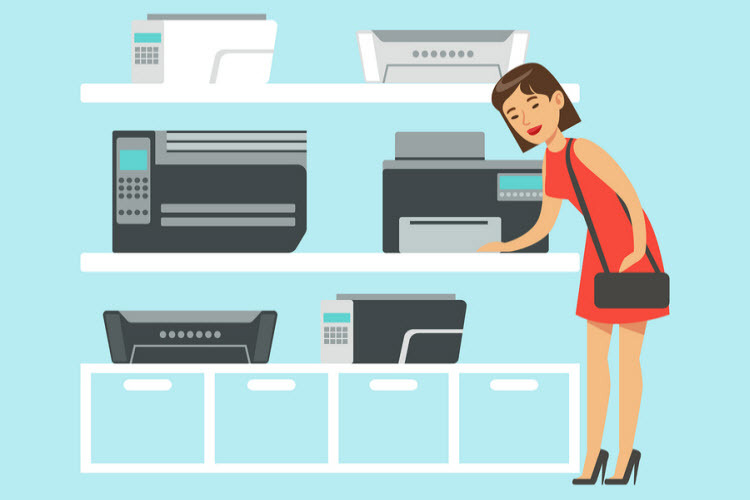 When you consider the amount of printer options out in the market today, it’s no surprise that most consumers find printer shopping a pretty daunting task. As printer nerds, we’d like to offer you some advice that can help you find the right printer you need in the simplest way possible. We’ve found that asking yourself the following questions helps identify the best printer for your needs. Let’s begin! One way to determine the right printer for you is by understanding your printing needs. Here’s a quick rundown based on the environment you’ll be printing in. We go deeper after this section. Printers built for low volume printing and have the versatility to handle documents as well as colored images are best for home printing. 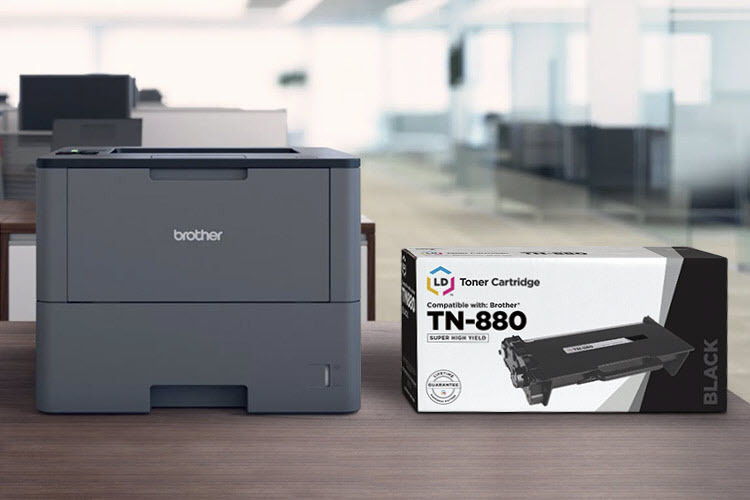 Inkjet printers were traditionally the go-to choice by home users but the economy, durability, and improved performance of laser printers have made it favorable home printer option as well. The go-to option when shopping for a printer for the office is a laser printer. Laser printers can print large volumes of text for a long period of time, making them the workhorses of the workplace. You can choose between print-only printers and multi-function printers that also provide scanning, copying, and faxing capabilities. Colored laser printers are perfect if you occasionally need colored prints in addition to the high volume document printing needs of the office. Low page yield laser printers are best for school use. 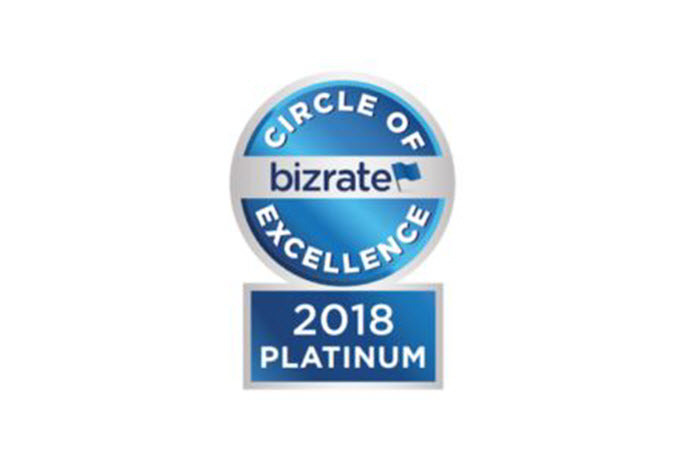 They’re more affordable than inkjet printers in the long term, more affordable than office laser printers, but just as reliable when it comes to producing documents as you need it. Nothing beats the colored imagery produced by inkjet printers. Avoid the cheap inkjet printers, however. 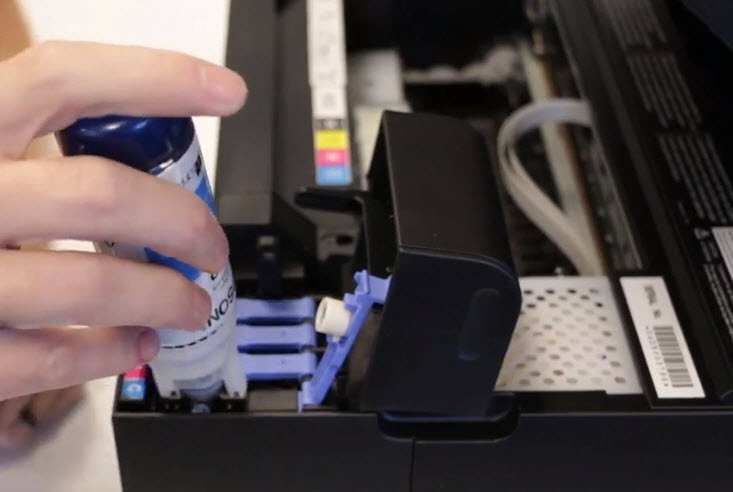 Most cheap inkjet printers tend to use a lot of ink, not to mention their cartridges usually carry a small amount of ink compared to pricier models so you end up replacing ink often that you very soon out-price your printer. For high quality colored prints, go for inkjet printers with no less than 6 ink pots. Epson and Canon are great brands you should look into. If your printing needs are a mix of a few of the above categories or you’re still not sure about what to get, we suggest you read on to get a better understanding of available printer capabilities and which one you really need. Do you need a printer for just printing, or will you need it to also have scanner, fax, and copier capabilities? Single Function Printers: These are machines built for the sole purpose of printing. If you need a printer that prints documents and nothing more, then this is the printer for you. All-in-One Printers: These are printers that also come with scanner, copier, and fax functionalities. If you’re looking for a printer that you can also use to scan, copy and/or fax documents, then a multi-function printer will get you more bang for your buck. Will you print mostly documents or will you print photos and colored images? Will you print a lot? Laser Printer: If you’ll be printing mostly documents, get a laser printer. Laser printers are fast and perfect for high volume printing. However, to say that laser printers aren’t good for colored prints would be an injustice. Although laser printers are known for their ability to print documents fast and for being more cost-effective than inkjet printers in the long run, it is worth noting that color laser printer technology now delivers competitive color image quality when compared to inkjet printers. Though color laser printers still have a long way to go in producing pristine gallery quality prints, it is now very much an affordable option for the everyday user for day-to-day photo or color printing. In terms of print volume, get a laser printer if you print a lot. Laser printers are built to be more durable and can print more pages over time compared to inkjet printers which are built more for occasional printing. Using an inkjet printer for high volume printing is guaranteed to be incredibly expensive due to ink replacements in the long run not to mention considerably shorten the lifespan of your printer. Quick sidenote: If you plan on printing different media like brochures or cards, and you need a printer that accommodates a varied range of paper types and sizes, shop for inkjet printers. A printer’s manual usually indicates the types of paper it accepts. If you regularly print a lot of documents and don’t need to print high resolution colored images, get a laser printer (or color laser printer if you need color). If you occasionally print documents and colored images, get an inkjet printer. If you regularly print a lot of high resolution colored images, get a professional photo inkjet printer and look for cheaper ink cartridge replacements! If you’ll need to print on other paper types (ie. different textures or sizes) beyond the typical printer paper, consider getting an inkjet printer. Last but certainly not least, what’s the true cost of your printer? Please. 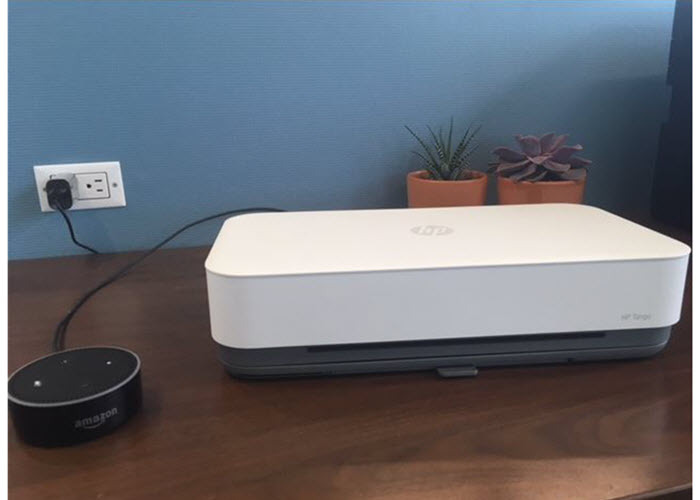 Don’t be fooled by cheap new printers that look pretty. The cheaper the printer is, chances are the more expensive it’s replacement cartridges are. The true price of your printer goes way beyond the cost of the printer unit. When shopping for a printer, be sure to check how much the printer cartridges cost. Let’s take the top 3 newest and cheapest inkjet printers out in the market today and compare them with more ink efficient pricier models to see the true cost each printer. *cost per page is calculated by dividing the cartridge price with the page yield. *page yields vary depending on how much ink is printed on a page. These estimates are based on 5% page coverage. Printing denser pages, or pages with more text and images, will use up more ink and will reduce the overall page yield of your cartridge. Notice how the slightly more expensive printers have higher page yields and the cheaper ones have a much lower page yield. What does this mean to you? If you have an HP DeskJet 1112 and you print 500 pages a month, you’ll end up buying replacement ink cartridges every month that soon the amount you’ve spent on cartridges will far outweigh the initial cost of your printer. On the other hand, if you have an HP OfficeJet 8710, you’ll only need replacements roughly every 2 months. Just imagine the contrast in expenses within a year! The bottom line is to keep in mind that buying a cheap printer usually means burning more cash on ink in the long run. Cost per page is very much a factor to consider when deciding which printer to get. 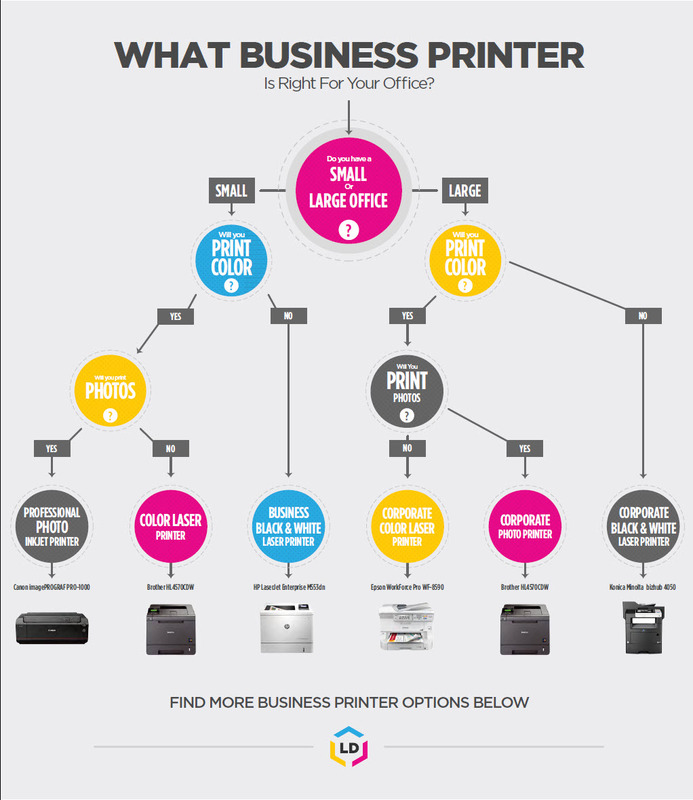 There are difference factors to consider when shopping for a printer home or office so we put together some infographics to better illustrate what they are. Knowing what makes printers different from others will help greatly when shopping for a printer that suits your needs. But first knowing what your needs really are is half the battle and will make looking for the right printer a lot easier. If you have any questions or need any help shopping for the right printer, drop us a comment and we’d love to help! We have a list of a few great printers for college students here: https://www.ldproducts.com/blog/best-printers-for-college-2017, which can just as easily apply to high school students! How many pages do you print a month? Do you need color prints too?